Make any space yours with 3M Command Picture Hanging Strips, a damage-free solution for decorating your home or office. Ideal for frames and other items 16 pounds or less, these handy strips will lock your pictures securely onto a variety of surfaces. Thanks to the innovative 3M Command adhesive strips, you can mount and remount pictures without damaging your walls- no nails, tacks, or tape required. Available in a several sizes and colors. Decorating possibilities abound with 3M Command Picture Hanging Strips. Display framed pictures, lightweight clocks and mirrors, and artwork on just about any wall in your home. Use these hanging strips to mount a dry erase board to your fridge for leaving messages, add pictures and favorite memorabilia to dorm rooms, personalize your office by hanging your diploma and awards. These strips allow you to take command of your space by adding your own personal style. You can easily remove the picture hanging strips without damaging the walls, so you're free to experiment with new decorating ideas and change your environment as often as you'd like. However you hang it, your item will lock securely into place. 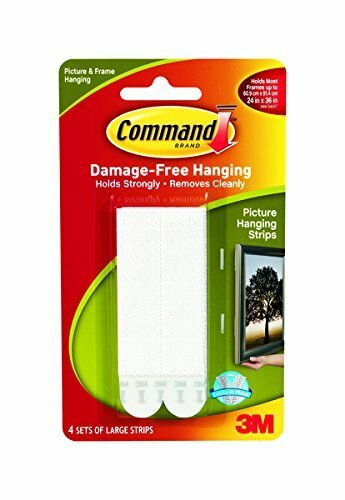 Applying 3M Command Picture Hanging Strips to just about any flat, clean surface is as easy as 1, 2, 3. Allow the adhesive strip an hour to set after application. An ideal alternative to nails, tacks, or tape, 3M Command Adhesive holds strong, yet doesn't leave a sticky residue or stains. To remove, simply grasp the hook and stretch the 3M Command Strip straight down slowly until the base and strip release from the wall. With 3M Command, redecorating or relocating items is easier than ever.